If you're looking for a casual yet totally chic ensemble, opt for a white lace long sleeve t-shirt and a black and white geometric mini skirt. Both items are totally comfy and will look fabulous paired together. If you don't like being too serious with your combinations, pair a camel coat with a black and white geometric mini skirt. When it comes to footwear, this outfit is round off wonderfully with black suede knee high boots. If you’re a jeans-and-a-tee kind of gal, you'll like the simple pairing of a teal silk shirt and a Charlotte Russe tribal print bodycon mini skirt. 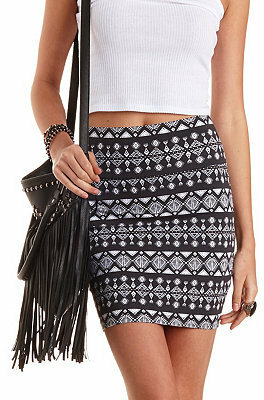 If you're on a mission for a casual yet absolutely chic outfit, dress in a black cropped sweater and a Charlotte Russe tribal print bodycon mini skirt. Both items are totally comfy and will look fabulous paired together. You could perhaps get a little creative when it comes to footwear and elevate your look with tan suede knee high boots.